So Week 17 was not a very good one for me. It started off fine and I was expecting to do two hard runs to cap off my training but I felt sick on Wednesday, got worse on Friday and hopefully am making a recovery on Sunday. Anyway, this is how it went. 10 days to race day. Again a rest day and I was feeling fine just chillin’ at home. Nothing to see here. Harrisson had put Tuesday down as an extra rest day but as my boy was going for a run about the time I got home from work, I decided to go with him as it would be nice and easy. It was an easy run and I finished it feeling great although the boy refused to get into any photos with me. I am not saying that it had anything to do with my run and condition, but all day Wednesday we spent every available minute checking in on the US Presidential results. 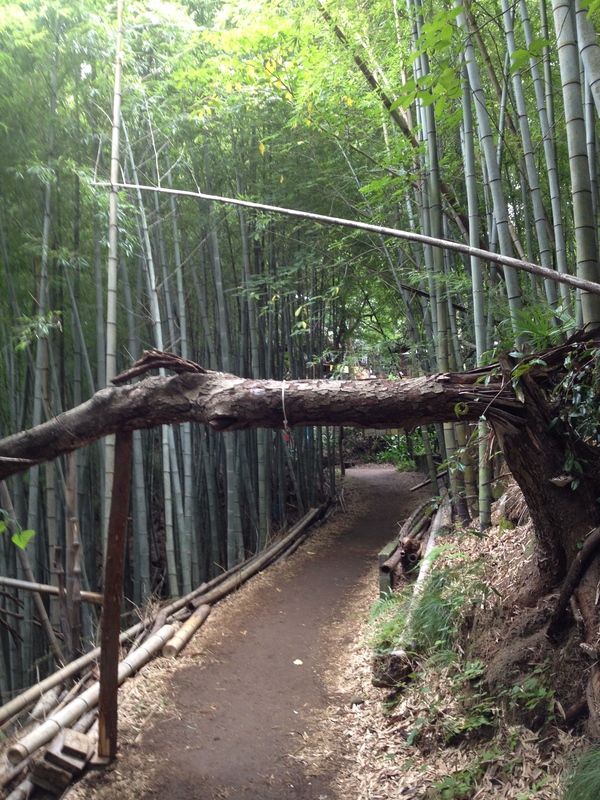 It really captured everybody’s imagination in Japan. Even my wife was texting me as it became more clear that Trump would win. It was quite a shock. I got home at a reasonable time and headed out the door to do my run. At the beginning I was feeling great as I bounded down the road and made the second corner in extra quick time. It was shortly after that that things started to go wrong. I started feeling dizzy and lightheaded. The plan was to run 5km at 4:15 ~ 4:20 pace but when I got to the river I knew that I was not up to it and just turned back for home, stopping at a Convenience Store to get an energy bar. I don’t know what had gone wrong, but I really felt out of sorts. 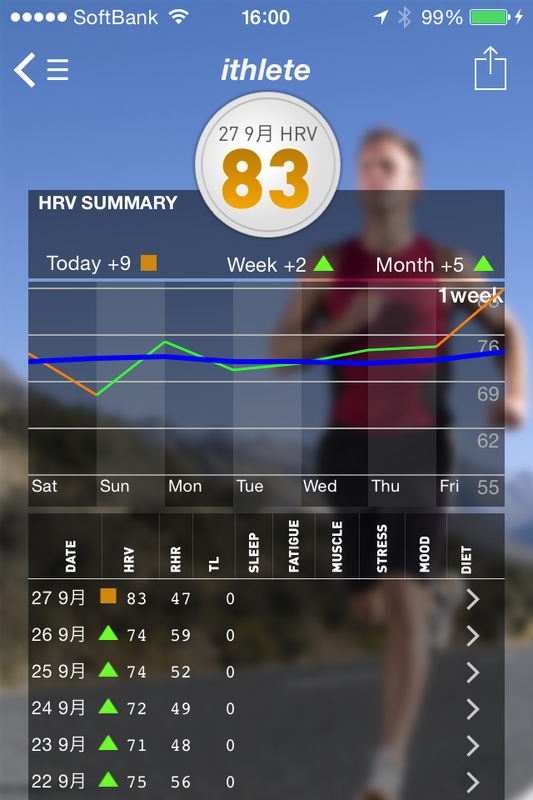 On Thursday morning my HRV had dropped 10 points to 65 and turned yellow. I did not feel too bad and still had hopes of doing the hard run that evening when I headed out for work. Even as I was walking home from the station, I was trying to talk myself back into it. However, when I reached home I was admitted to myself that I was just too tired and needed to rest more. My HRV had recovered a little my Friday morning but I was feeling cold with a runny nose and sneezing as I headed out the door. I felt OK during the morning but after lunch my sneezing and runny nose just got worse and worse and by 3:30pm I had to accept defeat and head home to bed. My wife collected me at the station and 10 minutes later I had drunk a Hot Lemon drink and was in bed shivering. Saturday my HRV was back to normal but I was still feeling weak and I spent most of the day in bed. 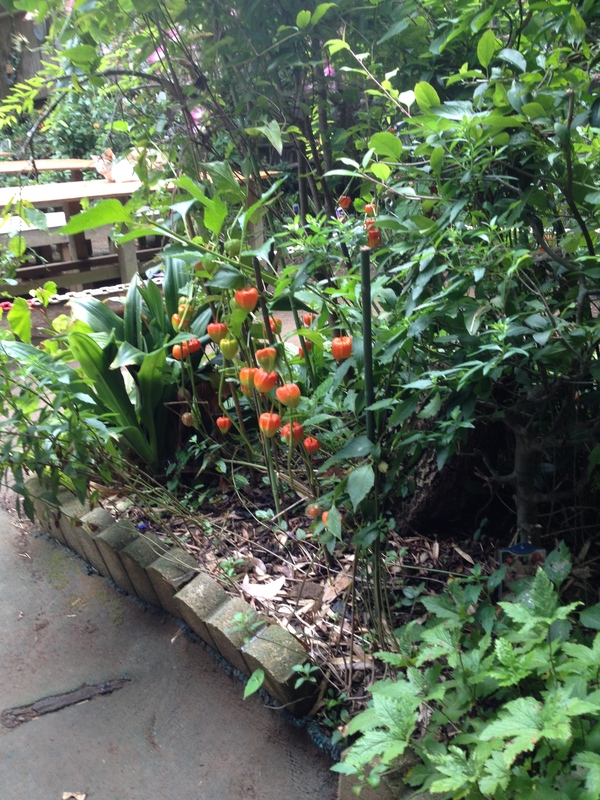 Sunday and you are probably glad that this blog post has to end. Hopefully I will be fully recovered in the next couple of days able to get in a few more runs before my race on 23rd November. And before I knew it Week 15 was over and I was just 3 weeks out from my marathon. Although I started base training almost 6 months ago at the beginning of May, it all seems to have happened very fast and I don’t feel at all ready. That may be because I have had a rough couple of weeks and I feel battered and bruised. I can expect that things will get better after the taper but truth is, I have never really performed well during the final three weeks before a marathon. I run too little, I eat too much and I generally start to doubt what I can do. The confidence that I had running around Gaienmae in July seems all but a distance memory as I stumble from one niggle to another and another week of 2 or 3 runs instead of 5 or 6. At least this time I know that I experiencing the blues because I am rather sad that my training is coming to an end. I have enjoyed it immensely, especially the motivation and support from Harrisson. I will miss his late night mails with my weekly schedule and his WhatsApp early in the morning with inquires about my latest injury or a request for me to restart logging all the Cinnamon Rolls I eat on MyFitnessPal.com. It has been a good and enjoyable journey and like all journeys it must come to an end. This week I only managed 3 runs and only 1 was a quality run. The soreness in my left leg has continued so Harrisson cut back my training and gave me extra rest days. The good news is that it started getting better towards the end of the week and my HRV has come back to where it should be. 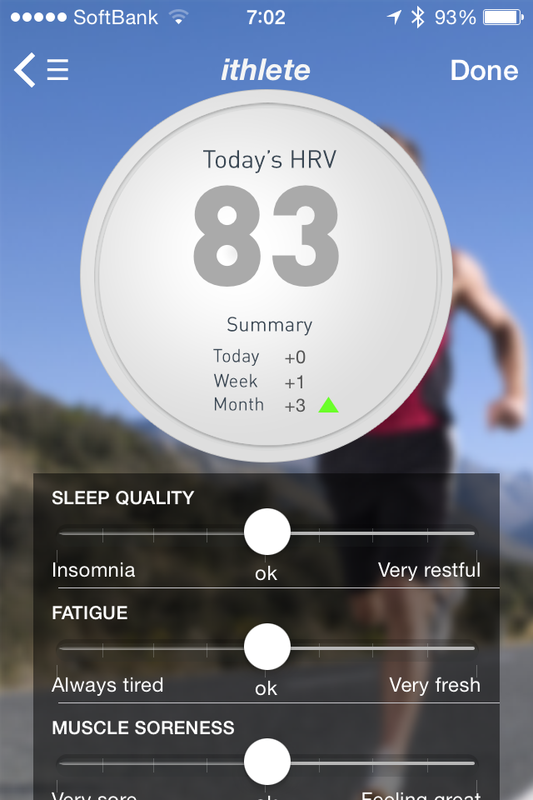 It was good to wake on Monday morning and see my HRV and RHR in the green. As the previous week had been so bad, I was afraid that I was on a downward spiral but reducing the beers and getting a bit more sleep seems to have had some effect. 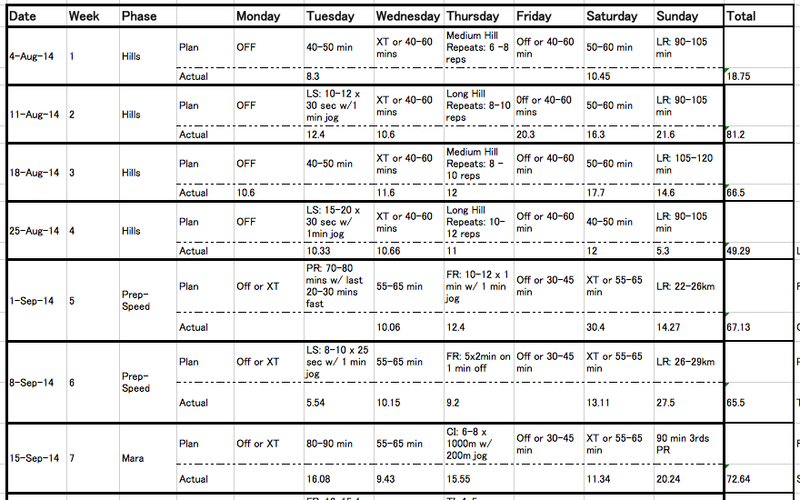 I could not complete all the requirements of Sunday’s workout but I had done enough to sleep well and wake up rested. As we parted on Sunday after the Long Run, Harrisson had told me to take 2 days off to rest my legs and get back on track. I was happy to do this as I had a real life event after work on Tuesday and got back late. On Wednesday I was due to restart training but I had another real life event in the evening and got home too late to run so I knocked it on the head. Still, I was happy to get an extra day’s rest. Wednesday was also the day that I noticed how far the construction around our office had advanced. All the old shops and restaurants are being demolished to make way for a mega-building. Tokyo is changing so fast these days, there are few places that I can recognize from the early days. I remember taking the Yamanote Line in 1991 from Meguro to Hamamatsucho to work on the Irish Network newsletter and seeing the old Minato Sports Center from the train window. 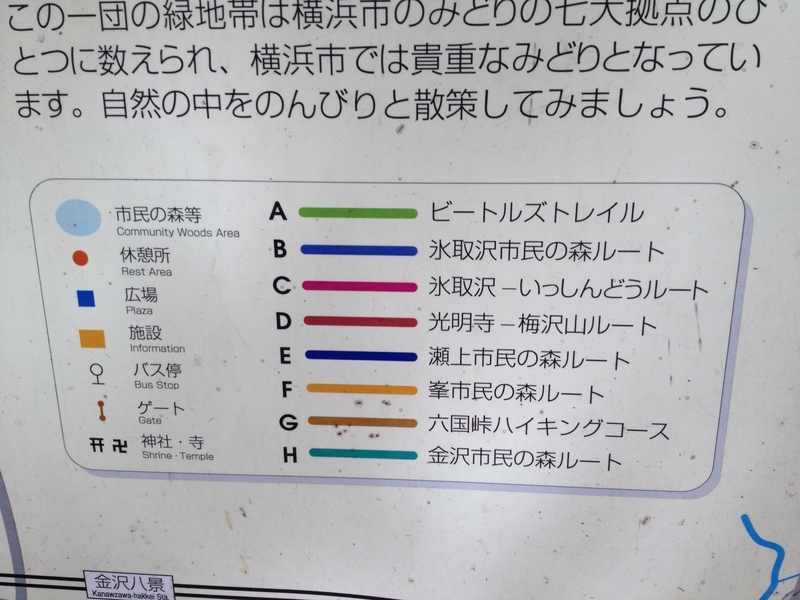 I did not live in Minato Ku and I longed to be able to use that center. Now it has been knocked down and replaced by the construction site beside my office and I go to the new Sports Center 200m down the road.It’s a funny old rock ’n’ roll world. I was happy enough with the time as all 2,000 intervals came in just under 4:15 pace but I still had a nagging feeling in my left hamstring. Friday was another scheduled rest day which was good as my HRV had taken another dive. It was also the day we celebrated Halloween at work. In previous years, my children had come in to see the office but this year they were all too old. However, it was nice to welcome in the children of my colleagues and give out candy. As I was heading out of the office I got a mail from Harrisson that his latest Q&A on his site had been updated. It was an answer to a question from my colleague as to the reason for cramping late in a marathon and how to avoid it as well as how to avoid hamstring issues. It was very well written and I quickly shared it with all my running colleagues. That evening I finally kept my promise and made it to the pool. The Minato Ku pool was closed for inspection so I headed up to Shibuya where the pool was almost empty as usual. I was glad to still be able to swim 1km without stopping (too much). The good news was that my leg felt great afterwards. Run: MAF Run with 6 x 20 second strides. On Saturday morning my HRV had returned to normal and I had an appointment with Mizogami Sensei, my local osteopathic council. I had set up an appointment the previous morning when I felt that my leg was not getting any better and I was beginning to run out of time. At this stage, I think that Mizogami Sensei is well used to me calling him urgently a few weeks before the Ohtawara marathon with some injury or other and I am always amazed at how he can find out the issue and help me out. This time he pushed my leg up and down and to the left and right before homing in on the weak spot and working on it. 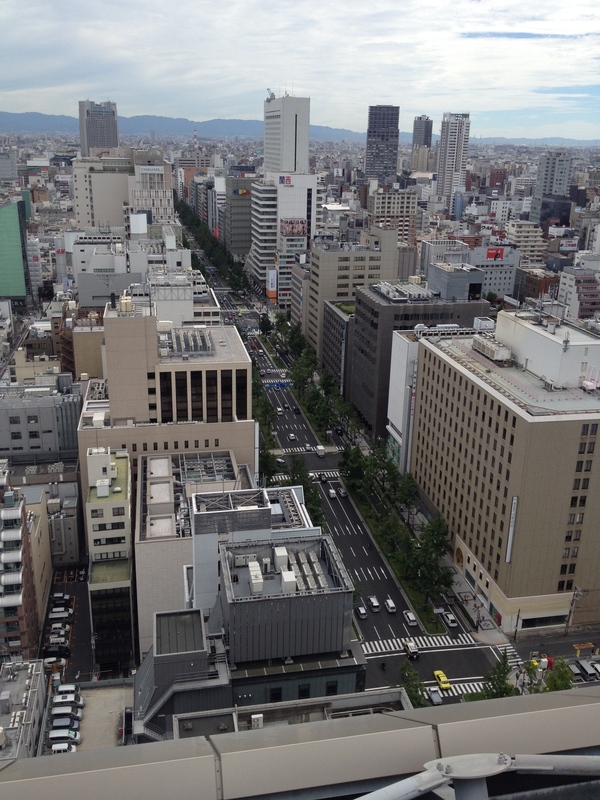 After leaving the clinic I headed into Shibuya for my run and another swim. This time I ran in Yoyogi Park in the heart of Tokyo where the autumn leaves where just beginning to fall. It was very beautiful and hundreds of people where out enjoying the weather and looking for Pokemon. I found the MAF portion of the run no problem but I was still sore during the strides. I texted Harrisson afterwards and he told me to only do a 21km MAF run on Sunday with no speed work. After the run I headed back to the gym for another 1km swim. After not swimming for months I was delighted to swim twice in 2 days. My HRV was still in a good place on Sunday morning but because my leg was sore on Saturday, I still planned to just run 21km at MAF. The day was cloudy and a little cold and it was the first time that I wore a long sleeved shirt since spring. The run went well and I was able to run MAF at a 5:41 pace which is good for me. I hope that that means that my fitness level is good and that I can taper well. Next week I should start my taper. I am not really sure what Harrisson has in store for me but I am looking forward to finally getting ready for my race in 3 weeks time. Monday, as always, is a rest day. That means no running, Jon Holmes. I know you are reading. I was pleased that my Resting Heart Rate and Heart Variability had not dived down after the weekend and went about relaxing in the evening. It was a hard workout and I was pleased to get most of the intervals at the correct pace. 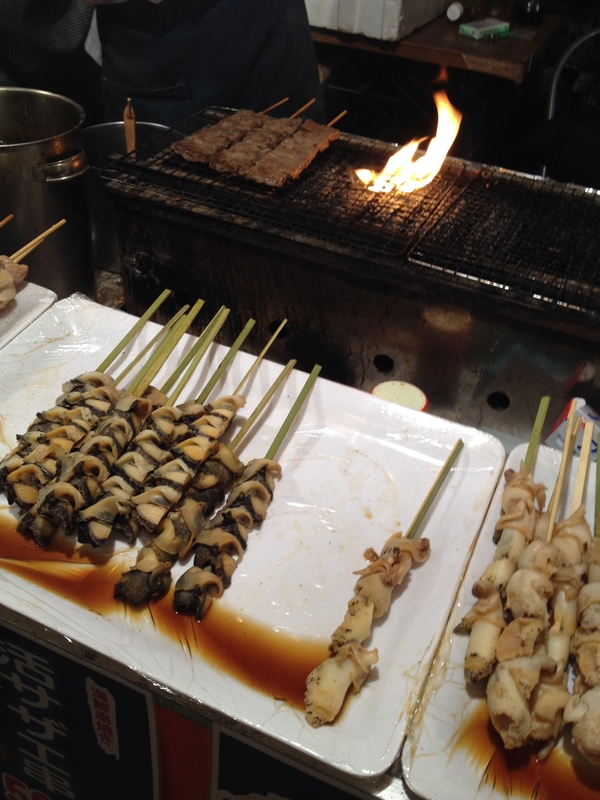 Wednesday I had an appointment to meet Mark and headed into the TapRoom in Harajuku. It was a bit of a shame as my HRV had reached 86, which I think is a record for me. Thursday I had a real life event and did not get home until 8:30. 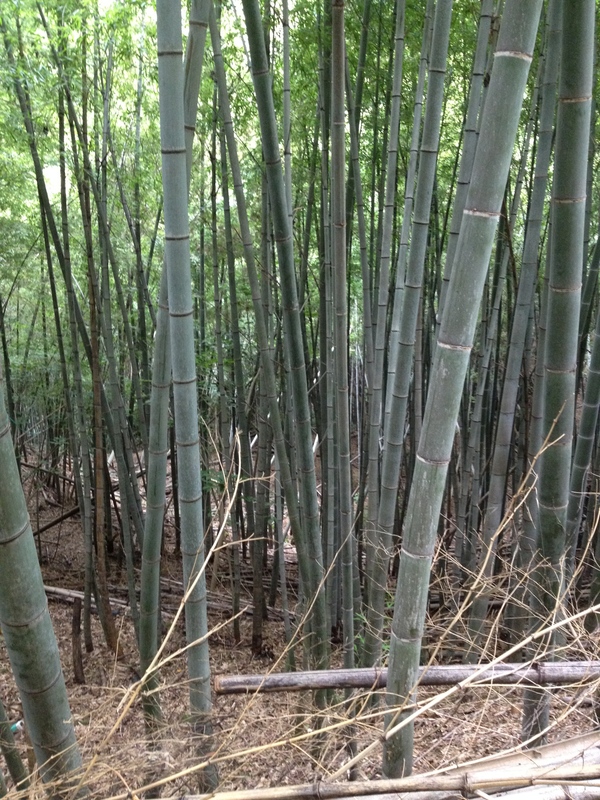 Still I changed quickly and headed out for the Tamagawa. It was a nice easy MAF run and I got home by 10pm and made it to bed early enough. Friday I got home at reasonable hour and headed out to run 7km at MAF and the rest at 5:20 pace. I felt good and light and ran the last 5km a bit faster than I should have. My right foot was a bit sore as I ran the last 1km but as soon as I stopped I felt fine. I had planned to go run in the morning but just as I was about to get ready, we realised that today was the day to bring the rabbit to the doctors. The rabbit was fine and after that we went and got lunch and coffee at Bill’s in Futakotamagawa. When I got home I headed out for my run, a little worried about my foot although it was not sore at all. The run went fine and even though I ran 8 x 40 sec strides I felt not pain and thought that everything was fine. Sunday was always going to be hard. A 31km long run with the following thrown in for good measure. I got to bed early on Saturday night as I had to get up a 5:30am on Sunday to drop my son to the train station for his rugby game. When I headed out to the station the overnight rain had stopped and the sun was coming up. The plan was to come home, have breakfast and then head out for the run before 6:30am. Unfortunately my dear friend John in Malaysia sent me a link to the Making of Fr. Ted documentary and I started watching that as I ate. By the time that it had finished, it was bucketing down. I decided that I still had plenty of time, and as I was a little tired from the early rise, I headed back to bed for an hour to catch up on some sleep. When I awoke for the second time, I looked out the window and it was teaming down even more than before. Absolutely lashing. I considered going back to bed again but then I decided that it was a mistake of my own making and I headed for the door. As I was walking down the stairs, the rain game down even harder and I stopped and looked at it. Would it be so bad to go back home, just for one more coffee? The rain might stop in the meantime. I looked at it again. This rain was not stopping. It would be going for the next 4 hours. I headed outside, knowing that once I got wet there would be no going back. My Garmin synced with the satellites in seconds (this never happens on a regular day) and I had no more excuses to procrastinate. I started to run. It was murder. 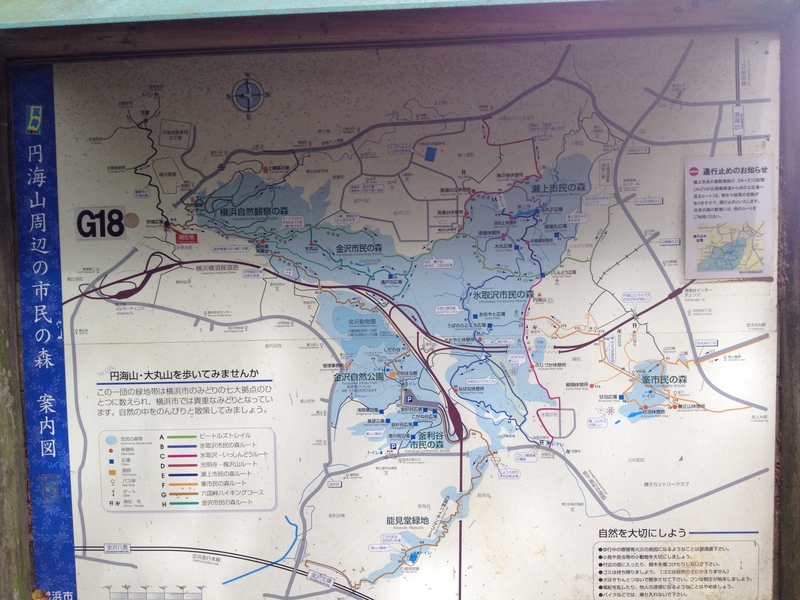 I started on my usual route for the Tamagawa and was soaked within seconds. I was quite anxious and my heart rate was up to 168 within 500m. Before leaving I had joked with Harrisson that as there was a gale I would run all the fast 1km segments with the wind. He didn’t find it funny. Maybe it is a French thing. However, when I got to the river, I decided that I would run the first segment against the wind and the next three with the wind and the final one against it again. The first 1km did not go to plan. Maybe I was not warmed up enough or maybe the wind had too much impact on me but I really struggled. The next one went much better and I was able to stay within the assigned pace. The third one I struggled again as I got near to Tamagawa-ohashi bridge. I had taken a gel 1km before it started but it seemed to make no difference. Half way across the bridge I switched into the 4:30 pace 1km and shortly after that I ran into Mika and Nick coming the other way. There were not many people out running except for an Eki-den being held at Furuichiba and I would have liked to have turned around and run with them but I had a pace to maintain. 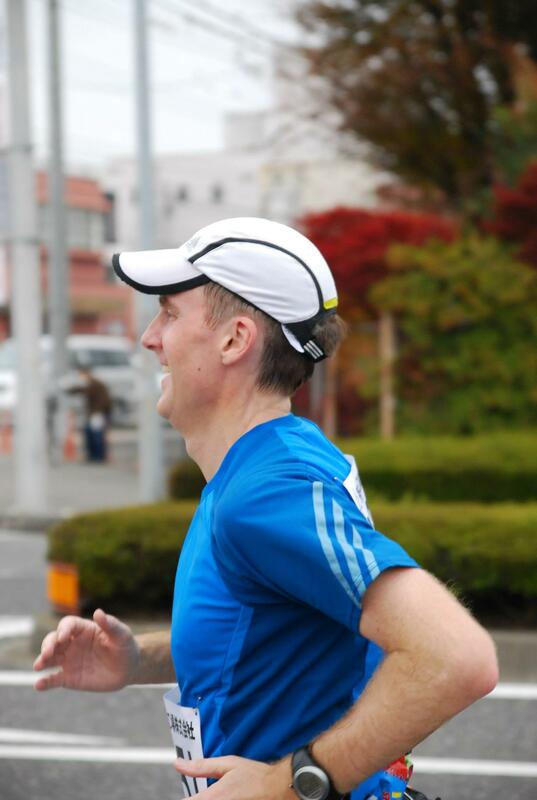 I kept running back up the Tokyo side of the river, past Gasubashi and eventually turned around at my 17.75km point. I had planned the turn-around so that I could do as much of the fast 1km on a straight section with the wind and it worked out well as I was back on track and headed back downstream and across the bridge. I passed the drinks vending machine just after the bridge on the Kawasaki side but once the 4:30 pace 1km was done, I turned around headed back to have my first sports drink at 20km. After that I was on my way home and headed back up the Tamagawa. The last fast 1km started between Gasubashi and Marubashi. I was tired and I struggled into the wind. I could not keep the pace during the 4:05 pace 1km but I managed it well enough during the 4:30 pace 1km. Once it was over at about 25.2km into my run, I felt a lot of pain in my right foot again. I thought that I could run it off but it was not getting any better and I considered stopping and walking back home. I did stop and take off my shoe and sock and massaged my foot for a few minutes. I then carefully put my shoe and sock back on and started to run again. I felt nothing. I was quite amazed and finished the run rather pleased with myself. Once I got home I looked at FaceBook and saw that lots of people had left motivational messages and a video for me to go out and run despite the rain. I was very moved and very glad that I did. I then cleaned up and I started with the cold spray on my right foot. Hopefully it will have the required impact before my next run in 2 days time. 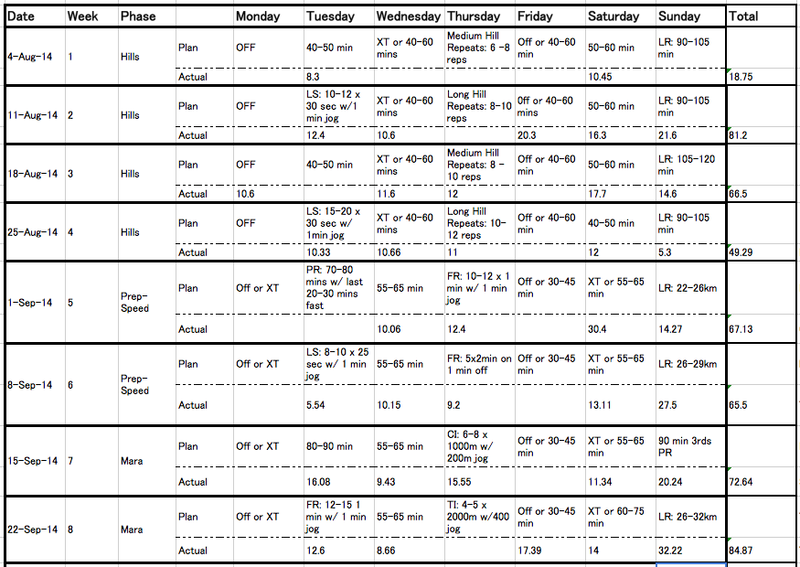 Week 8 sees me exactly half way through my training plan. It was a good week where I managed to compete all of my runs and run the best part of 85km. I had been worried about not have done a serious long run but I got that out of the way on Sunday. The week got off well with a 1100m swim on Monday night. I have been enjoying swimming over the past three weeks and each time I manage to add a little bit more to the distance. At some point I might be able to make it up to 2km. 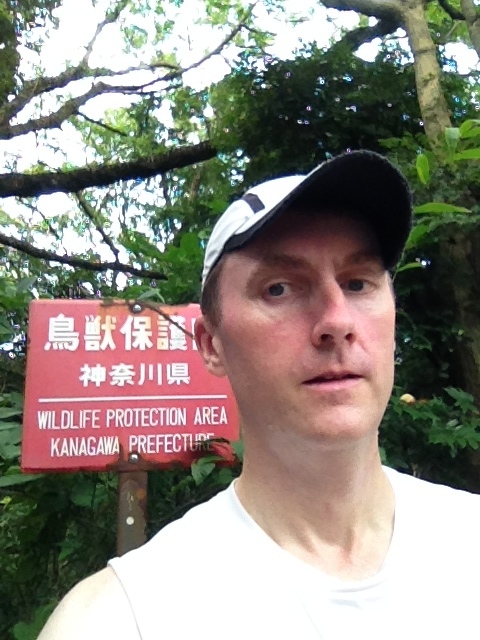 Tuesday was a National Holiday in Japan so I took advantage of it to go and do my Fartlek workout in the morning. It was a lovely day with the sun shinning but not too warm. I was a little bit cautious of doing all 15 intervals as I tend to tire after 6 or 7. However, this time I managed to keep on going and there was not a great different in distance ran over the 1 min interval between the second and the last. The first one was a bit faster but that is to be expected when you are a little bit fresher. As the lactate acid starts to build up, it is harder and harder to turn the legs over. 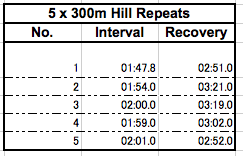 Wednesday was track night and this week, as it was the last Wednesday of the month, was to be a 5000m Time Trial. I had been secretly looking forward to it as I had been getting better at the weekly intervals and truth be told, I was expecting a good time. Unfortunately it was not to be. Beforehand I synced up with Michael and we decided to try and pace each other at each 1km with me going first. The plan was to run at 3:50 km/min pace which if we stuck to it would leave us with a 19:10 5km. Michael kept to the pace very well finishing with 19:22 but I was in trouble from the second kilometre. I dispatched the first kilometre in 3:48 and then Michael went past me to lead for the second kilometre and that was the last I saw of him. I finished the second kilometre in 3:56 and shortly after that Bob came by me with an impatient look on his face. He had been right behind me and told me later that he was worried the the second kilometer was so slow. From then on it was a War of Attrition as I tried not to loose too much time, but once you go over 4 min/km the head tends to drop and it is hard to pick it up again. Anyway, I finished in 20:08 which was not terrible but also a good reminder to me that I still have a long way to go. I don’t know if it was the Progression Run on Sunday, the Fartlek on Tuesday or the few bottles of Craft Beer but I just did not have it in my legs. I met Bob afterwards and he admitted with a smile that he rested a bit on Tuesday. I had been taunting him the previous week that I beat him in every interval and he was now having his revenge. However, he who laughs last …. It was the birthday of my younger daughter on Thursday so instead of running there was a birthday party with ice cream cake. On Friday my elder daughter was coming back to Japan from her 10 week home stay in New Zealand so I took the day of work to pick her up from Narita airport. That meant that I had time to do my Tempo Interval from Thursday in the morning before I left. The morning was hot which is never good for me and I was feeling thirsty from the start. I had gone back over the McMillan Training Paces with my time from the 5km on Wednesday night. Originally I had put in the times from the 1600m interval the previous week and it told me I should run the Tempo Intervals at 4:17 to 4:25 which I though was very doable. Now with the new information, McMillan was telling me to run them at 4:07 to 4:15, which would take me a considerably more effort. The plan was to jog to the river, run 3 intervals down and 2 intervals back and then jog the rest. I don’t know if it was the sunny weather, the ice cream birthday cake or the bottle of Chilean red wine, but I was toast after the second interval and decided to reduce the number to 4. I put on my best game face and made it back up the river to complete numbers 3 and 4 in slightly less time that I had run down. I then spotted a water tap and headed over to it to drink close to a gallon before getting up and doing interval number 5. I was pleased to complete all 5 intervals but, as you can see from the table above, I could not hold it within the expected timeframe. 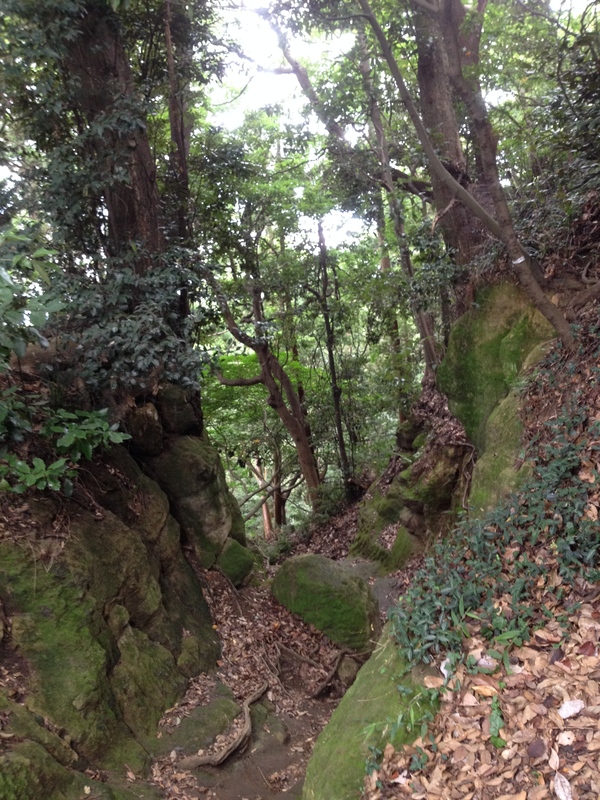 Saturday saw us back down in Yokohama for my son’s soccer and my trail running. The plan called for 60 to 75 mins of running and I duly obliged by running along the trail for 37.5 mins and then running back to make it an even 14km. I felt good and made it up to the top of the first hill in 14:34 where it had taken me 15:15 last week. Of course the weather is getting better each week and I am carrying less stuff with me. This time I left my iPhone behind. An interesting fact about my HRV was that it was 83 when I work up on Saturday morning. This was such an unusually high number for me (never seen before), I took a photo of it. It was green, as expected, so I was ready to run. I was still surprised at the number, so I looked at it again later and saw that while the number had not changed, the colour had gone from Green to Amber. I could not understand this so I put a question on the ithlete forum. They are very good at getting back to people so I will let you know when I get answer. Sunday is Long Run day. My son had soccer again down in Yokohama but I did not want to do my long run on the trails as the pace would vary a lot. I also did not want to break it up into two segments as that, while some times necessary, kind of defeats the purpose of time on your feet. Therefore I waited until I got home and started off at just before noon when it was already 25 degrees Celsius. Fortunately, that is not the temperature that I will be running my marathon in in November but sometimes it is good to practice in a bit of heat. While I can write that now, I did not feel that way when I headed out the door and started plodding along in the mid-day sun. However, gradually I started to feel a little better but never great. There are many Schools of Thought as to at what pace you should run your Long Run. Philippe tells me that Daniels recommends your Marathon Pace + 10%. For me that would be 4:57 as I hope to run the marathon at 4:30 pace. On a cooler day I might have attempted that but I stuck to the tried and test Marathon Pace + 45 seconds that I read in the book Mastering The Marathon by Don Fink. McMillan is not that precise. He says to run at a pace slow enough to carry on a conversation. Since I was running by myself, that is pretty hard to judge. Anyway, although it was tough, the run itself was good and non-eventful. I had my first drink of water at 5km and again at 17km, 22km, 27km and 30km. In all I drank about three litres of water but I did not take any gels or sports drinks. This is good for me as they do tend to upset my stomach. I am not sure what I will do in the race itself. I had planned to juice some apples and mix them with honey but I had better try it out before the race. 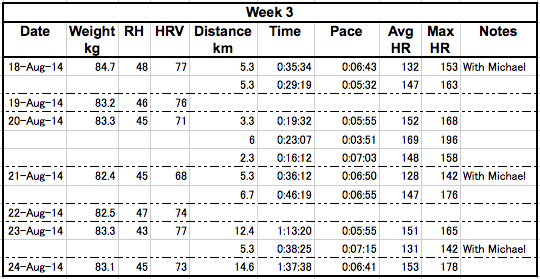 Week 9 will be another tough week with a longer mid-week run, Yasso 800s and a 35km Long Run. I am not sure how I will fit all this in. Week 7 went well. I was able to complete all the scheduled runs and managed 72km in all. I am feeling a bit tired at the end of it and I am looking forward to my rest day tomorrow and perhaps a spot of swimming. Monday was my rest day and also a National Holiday in Japan so I did not get to go to the pool. I did however manage a 10km round trip bicycle ride to my son’s soccer which was a nice bit of Cross Training. Tuesday’s plan was for running 80 to 90 mins. I thought that I would go out and do a moderate 16km in 90 mins but once I got to the river I felt fresh from resting on Monday and averaged about 4:45 and completed the 16km in 80 mins..
As always Wednesday is track night with my club Namban Rengo. I feel that I am getting stronger each week since the summer is over and my times are coming down. I have not run a 1600m interval in some time and I was happy to get in under 6 mins. It was touch and go for a while as I was over 3 minutes at the end of the second lap but managed to push it for the last 400m to get 5:59. Unfortunately I did not have my heart rate monitor with me so I don’t know how high it went. I am interested in seeing my Max HR again as I think that the 204 I saw on the Akasaka hill repasts in February may not be correct. 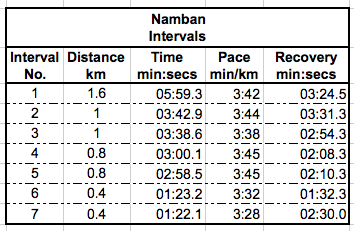 Thursday I was back on the McMillan Calendar (he does not include Namban Intervals for some reason) and the plan was for 8 x 1000m Cruise Intervals. I was not sure at what pace to run them but Philippe advised 4:30 and that worked out well enough. 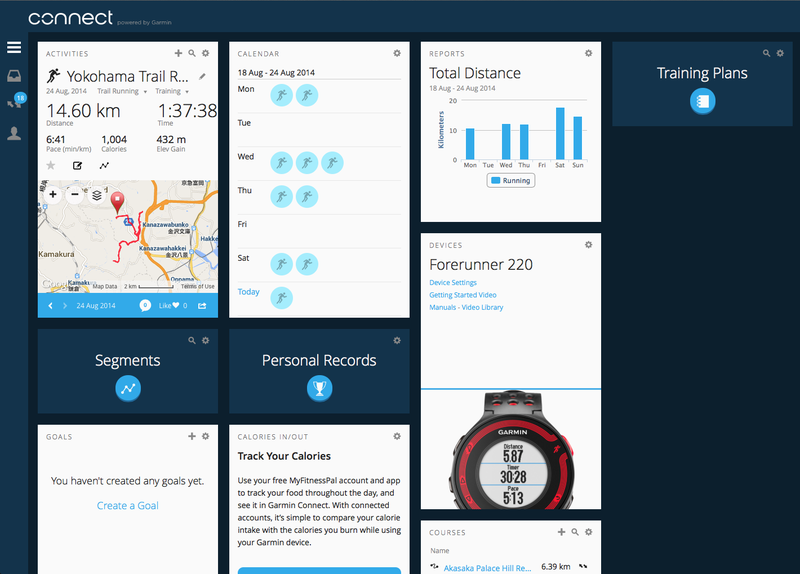 The Garmin Forerunner 220 is working out well and I am enjoying inputting the workouts. Unfortunately I got this one wrong and ended up running over 1200m for the second interval. I was will able to complete all 8 intervals and felt stronger at the end. Friday was my second rest day so I went to the pool and swam 1000m and did no weights. 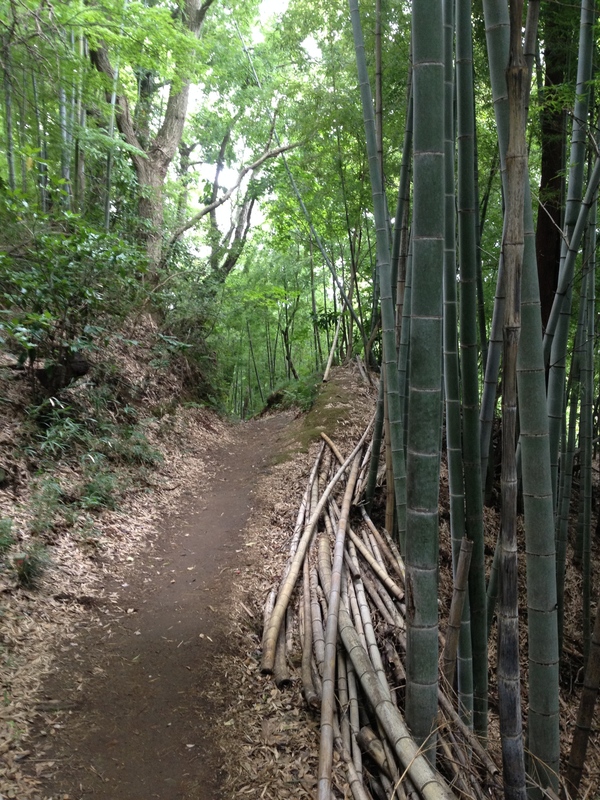 It felt good and on Saturday morning down in Yokohama I was feeling fresh again as I headed out on the trail. The plan called for 55 to 65 mins of running so I managed just over 11km in 62 mins. I was pleased that I reached the top of my first hill in 15:15. I reached this point in 15:55 last week and 17 mins 2 weeks ago. While part of this is down to improvements in myself, a lot of it is the cooler weather and the fact that I no longer have to carry a water bottle. When I got home I looked up Sunday’s Progression Run on the McMillan Running Site. It was a third’s run, which means you break the 90 minutes into three 30 minute thirds and steadily increase your pace through each one. I then started wondering about the paces that I was running and if they would help me reach my goal on a 3:10 marathon and I decided to sign up for the PRO section on the McMillan site to get his advice. On the left you can see what he recommends. I got this recommendation by entering my time for the 1600m last Wednesday and the target marathon time. Some of them are a little faster than what I had expected, such as the Tempo Run. 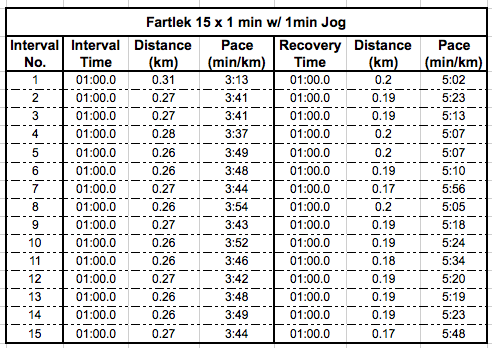 I generally consider anything faster that 5 min/km a Tempo Run but now I will have to look at that again. 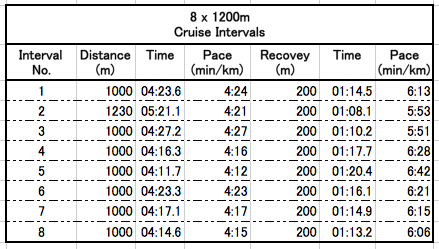 Also, the 1000m Cuise Interval is 4:13 to 4:20 which is almost what I did by default on Thursday. 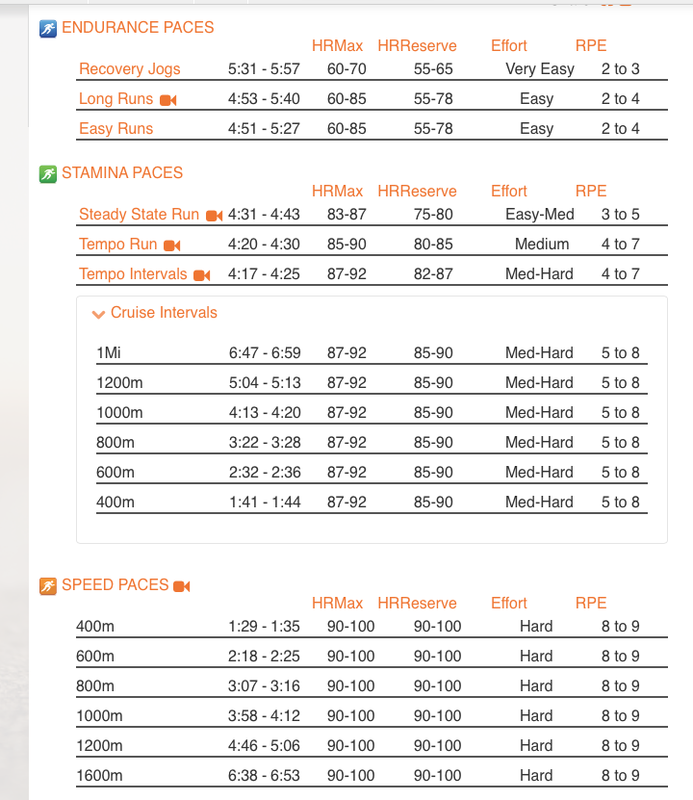 The speed paces are all a little bit slower to what I run at the track but the repetitions are greater. 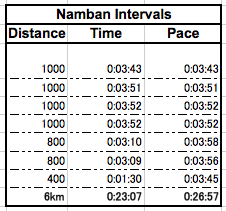 I plan to run a 5km time trial on Wednesday so I will do this calculation again and see if it changes. When I do this run again, I must force myself to keep the second third pace above 4:45 min/km so that I can run harder at the end. Next week will be tough again with a Fartlek, 5km time trial at the track, 2km tempo intervals and a 26km to 32km long run. I had better get off to bed and get ready for it. Week 3 was a good bit less mileage that Week 2 with 66km of running and 733m of elevation gain, but as I sit here on Sunday afternoon, I definitely feel a lot more tired than I did last week. This was probably due to the fact that I added a good trail run this morning for my long run and I am still feeling the effects. My mid week intervals and hill repeats in the heat also took a lot out of me and I am looking forward to a day off tomorrow. I was glad to see that my HRV and Resting Heart Rate stayed consistent throughout the week so it does not look like I am anyway close to over training. The weight has not budged, but that is probably due to my love of Craft Beer as anything else. OK, there has been the odd Shu Cream at 4pm (everyday of the week). I also owe a debt of gratitude to Philippe and Taro who stayed up late on Monday night to help me complete my Garmin Connect set up. It seems that you do need to install Garmin Express even though it kills Running Ahead. On the plus side my FR220 can now talk to my phone so I can upload my runs anywhere in the world as long as I have WiFi. I wanted to get that sorted before next week when I fly out :). Monday was scheduled to be a rest day but as I knew I would be late getting home on Tuesday I decided to go for our, by now, regular run with Michael and then do the same again myself. I used to run the 5.3km at a heart rate of 110 to 120 but as Michael has become more fit I am now running them at 130 bpm which is my official MAF so I feel quite justified in including them here. 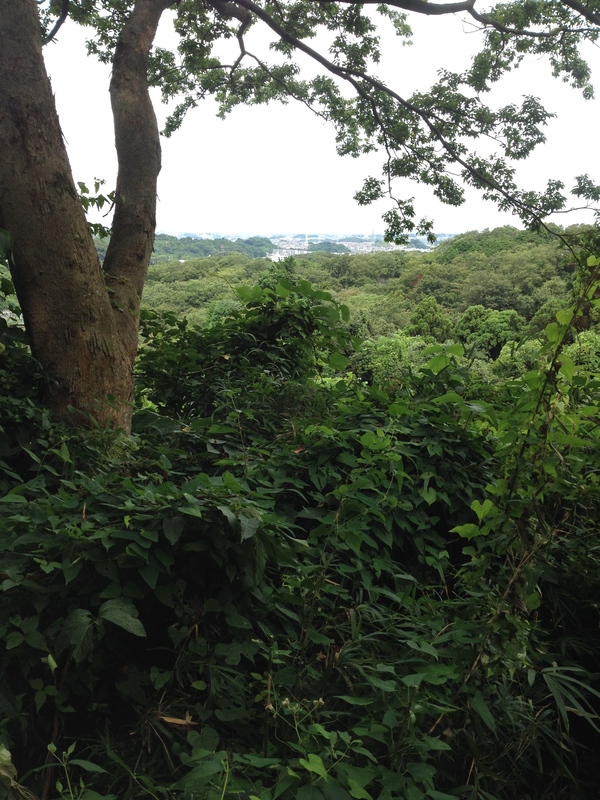 Wednesday was the Namban Rengo interval training at Oda Track near Yoyogi Park in Tokyo. 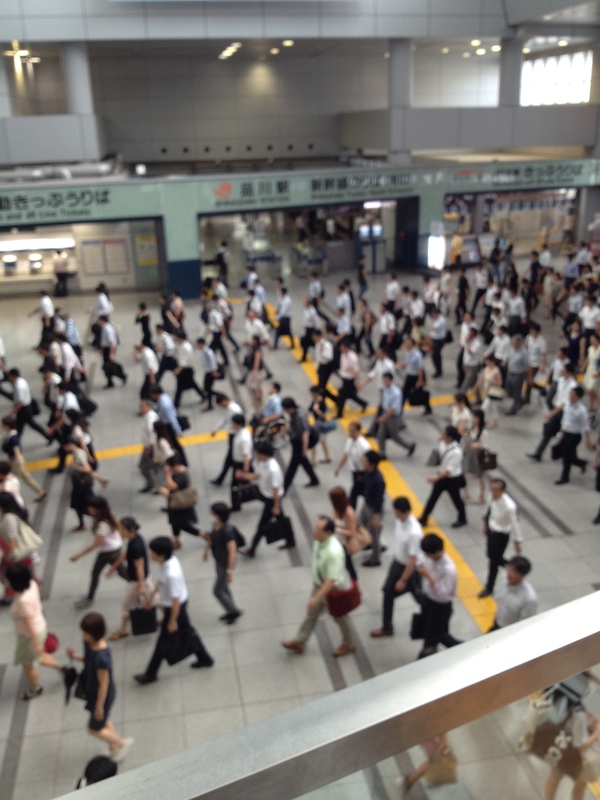 I had not been to the Namban workout since mid-July due to real world activities, and with the increase in temperature and humidity, I really felt out of sorts. Before I took the break I could manage all the 1000m intervals between 3:38 and 3:45, or there about, but this time was a real struggle and was quickly in the 3:50 territory. I would also expect to do the 800m around 3 minutes or less but could not get close to it this time. I managed to complete all the work outs which I guess I should be thankful for that. Thursday I had to go down to Osaka and I did not expect to be back in time to do any running. 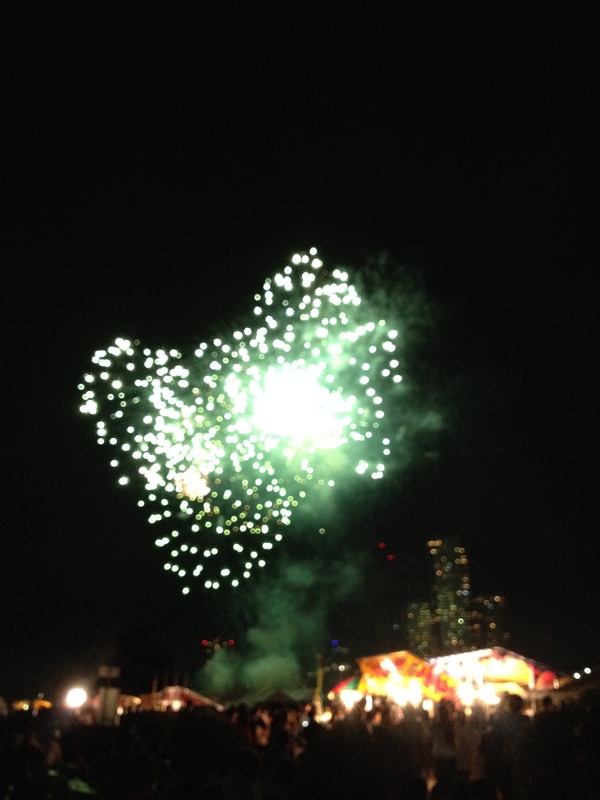 However, things worked out better than expected and I was on the road with Michael at 8:30pm for the 5km course. After that I decided to do the scheduled Hill Repeats. Friday was going to be a rest day so it would be my last chance to do them this week. The plan was to do 8 – 10 repeats of a 300m hill with about 23m elevation. 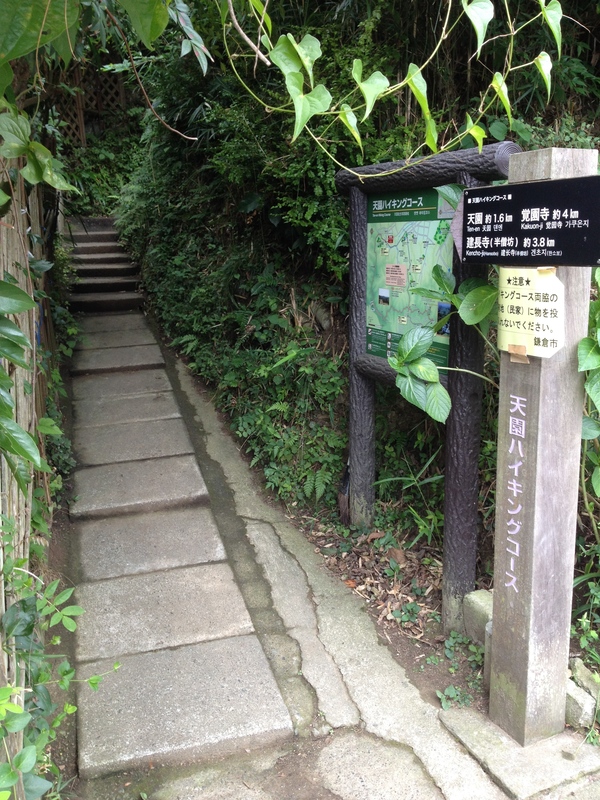 It is quite steep and I was exhausted as I started. I can only imagine the intervals on Wednesday combined with the heat and humidity was too much for me. Or I am getting old. I had hoped to do up to 8 but it was too much and I called it a day after 5 repeats. Saturday called for a 40 to 60 min run so I headed down the Tamagawa to Marukobashi for my usual 12.4km run before coming homing and heading out again with Michael. I thought that I would only do one run but the weather was very kind so I decided that I could manage another to try and get in some mileage. 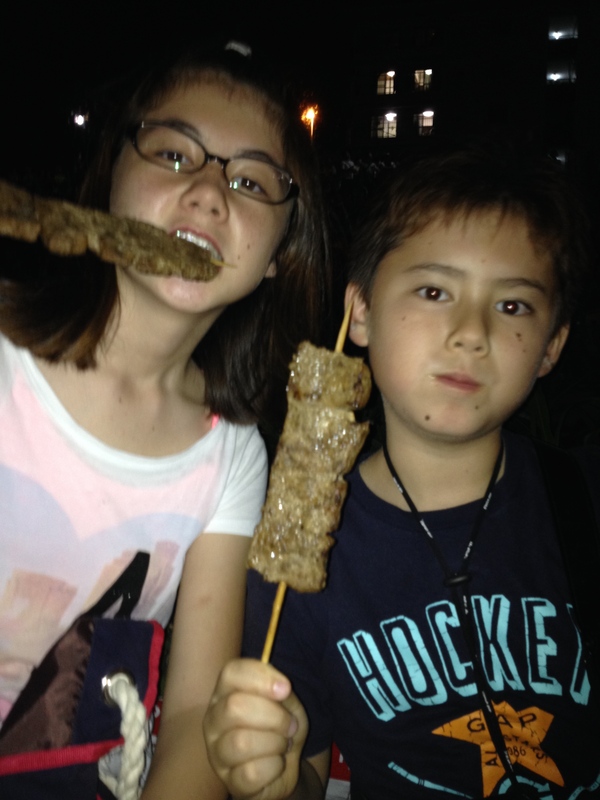 Saturday night was the annual Fireworks at Futakotamagawa so I took the kids and cycled over. 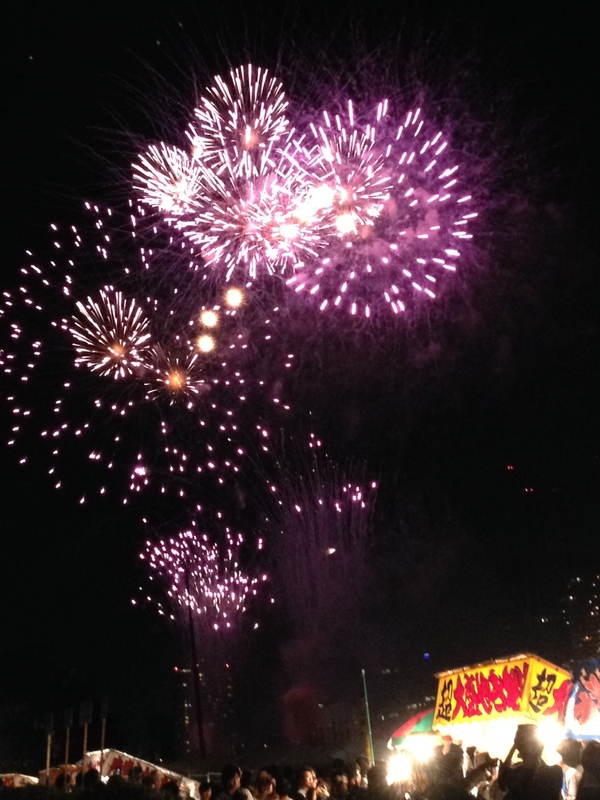 Although it had rained during the day, it was a beautiful evening and the fireworks were excellent. 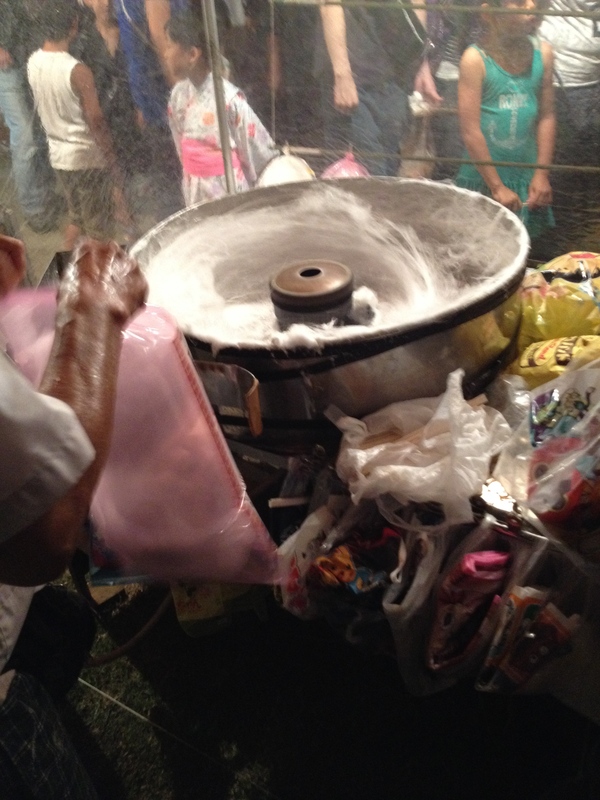 We also enjoyed the Kalbi Beef cooked on an open fire before getting some cotton candy to take home. Sunday was my son’s soccer again after the summer break so we headed down to Yokohama. 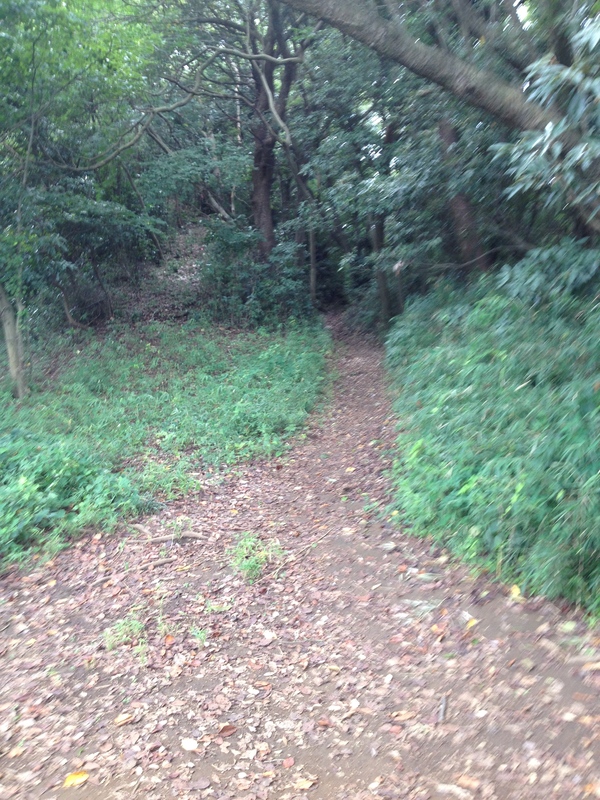 While he runs, I go over to the Yokohama Nature Park to do a trail run. 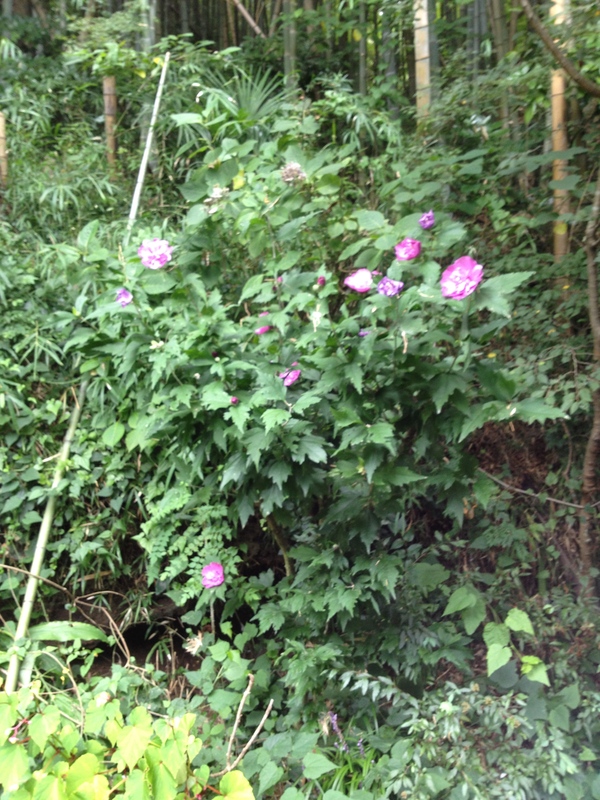 It is a wonderful trail through deep and lush forests and I cannot believe that I was taking him down there for 2 years before I discovered it. The schedule called for 105 – 220 mins of running and while I was out for 1 hour 45 mins there was probably only 1:37 of running. 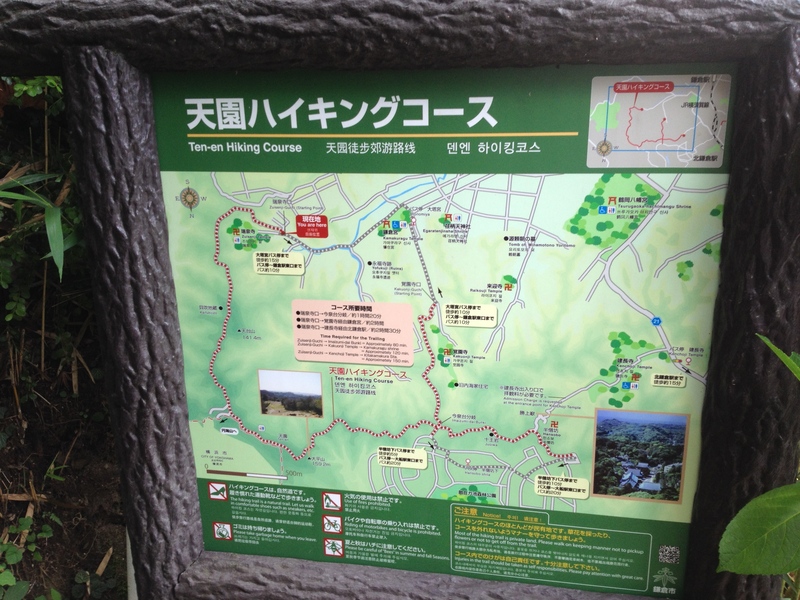 I found it very tough going and I was dropping time from the off. At the point that I reach the actual trail I was at 17:30 when I used to get there in 16 mins before the summer got hot. Still it was a great run and I saw lots of other people running and hiking. I took the same route as I took 4 weeks ago when I sprained my ankle and managed it without any difficulty. I am a little worried that I am not strictly following the program but I think at this stage 430m of elevation gain on a Sunday morning can only be a good thing. A – Beatles Trail or Beetles Trail? Where I wrecked my ankle last month. Next week I will be travelling so will not have a great chance to run but I will of course squeeze in a few where I can and add some photos as well.